SeaVenture- an amazing underwater experience! SeaVenture is an incredible underwater experience at Discovery Cove and it also happens to be one of our favourite experiences at the park. For those of you looking for something a bit different, SeaVenture is the perfect choice as it lets you walk under water and get up close to a host of amazing sea creatures! SeaVenture is a totally unique underwater tour, that lets you go under water and walk across the Grand Reef. 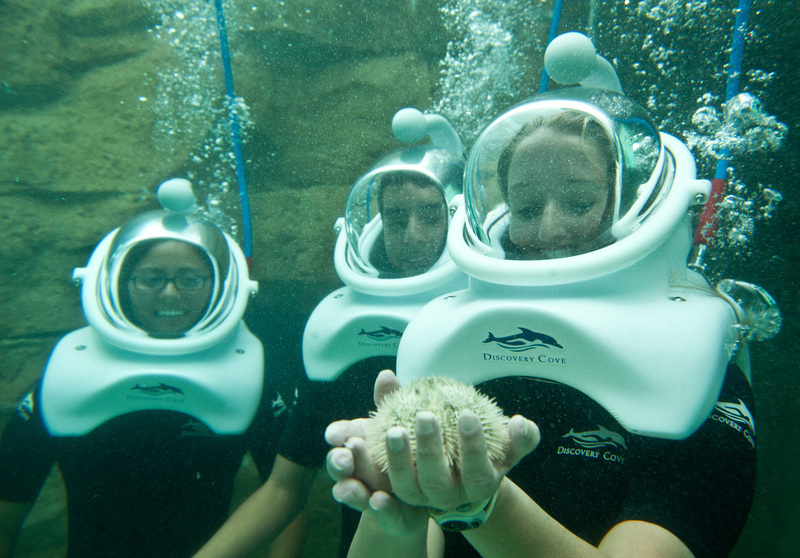 You’ll explore beneath the surface on foot, surrounded by more than 10,000 beautiful sea creatures! You’ll start by watching a safety video which will explain how the experience is going to work. You’ll then have some time to talk to the experts and ask any questions you might have. Then it’s time to get ready to go into the water. A member of the SeaVenture team will help you climb down the ladder until your shoulders are submerged and this is when you will be given a dive helmet that will help you breathe naturally underwater. These have their own air supply, so there will be nothing directly covering your mouth or eyes, which is great because it lets you see your surroundings perfectly. They might look big but when you're underwater they won't feel heavy, so don't worry. Once you’re completely under water, equalise your ears (the team will show you how) and get ready for your exciting adventure. Your guide will lead the way, pointing out different sea creatures as you go. You’ll also see the fish being fed and will get to hold some of the animals too. SeaVenture gives you the opportunity to go under water and discover more than 125 species of amazing sea creatures. Look out for colourful schools of fish, velvety rays and much more. You’ll even see a few sharks along the way, but don’t worry, they’re on the other side of a panoramic window so you’re totally safe! Prepare to get hands on too, as you’re invited to hold some of the unique sea life. There’s also lots of stunning flora and fauna in this picturesque coral reef, so look out for that too. How many people can say they’ve walked under water? This really is a once in a lifetime experience and if you want to make your Florida holiday even more memorable, this is the perfect way. Absolutely! SeaVenture is completely safe and you’ll have expert staff on hand at all times to help you with anything you may need. You’ll start with a safety briefing where you’ll watch a video which runs through the experience and tells you everything you need to know. You’ll also learn some important hand signals, which will allow you to communicate quickly and easily with your guide and group when you’re under the water. There’s also ropes along the side of the walls, so that you can hold on as you make your way around. How do you communicate under water? You’ll be taught a series of hand signals that will be useful when you’re under water. These include what signs to make if you have any problems and how to let your guide know that you’re fine and having a great time! Your guide will also have a white board so that they can write messages for you and tell you a little bit more about the animals that you’re going to see. How old do you have to be for SeaVenture? The minimum age for SeaVenture is 10 years old but it’s important to know that anyone under the age of 14 must be accompanied by an adult. Anyone under the age of 18 must have a parent/guardian present to view the safety video too. How long does SeaVenture last? The whole experience lasts around an hour from start to finish. This includes a safety briefing and approximately 20-25 minutes under water. Yes! SeaVenture is extremely popular and if you don’t want to miss out, it’s best to book your tickets well in advance to secure your place. You’ll also need to make sure you’ve purchased Discovery Cove tickets in order to access SeaVenture. Walking under water is something most people have never done before, so it’s understandable if you’re feeling a bit nervous. If you do suddenly change your mind when you’re in the water and you’d like to get out, all you have to do is signal to your guide using the signs you learnt in your safety briefing and the team will help you get out straight away. Do you need to have any diving experience? No! Don’t worry if you haven’t experienced anything like this before. You’ll be given all the information you need when you arrive and the SeaVenture team will make sure you feel confident before going into the water. For every SeaVenture ticket you buy, SeaWorld Parks & Entertainment will donate $2 to help UK wildlife charities, researchers and biologists. Want to try this amazing experience for yourself? Click here, to get your SeaVenture tickets.